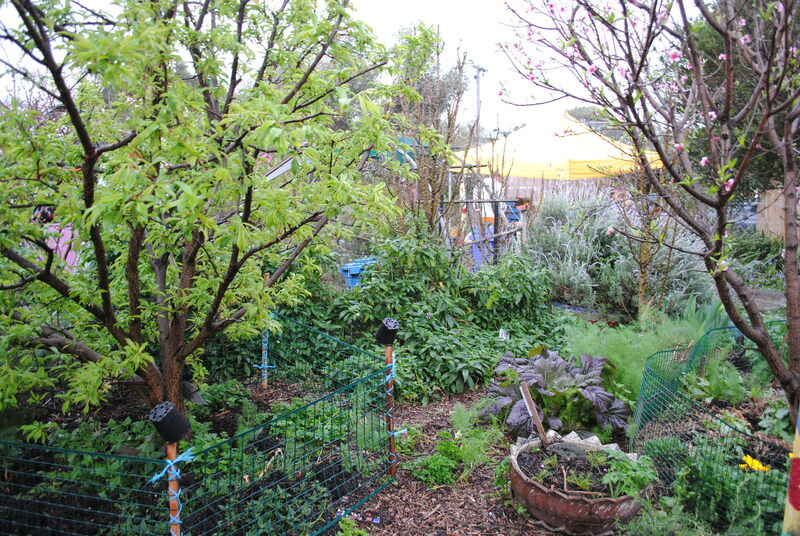 Sprout began just under 10 years ago, when Mind Australia took over a disused patch of grass with a couple of sheds and got to work transforming the site into the productive oasis that is the garden today. 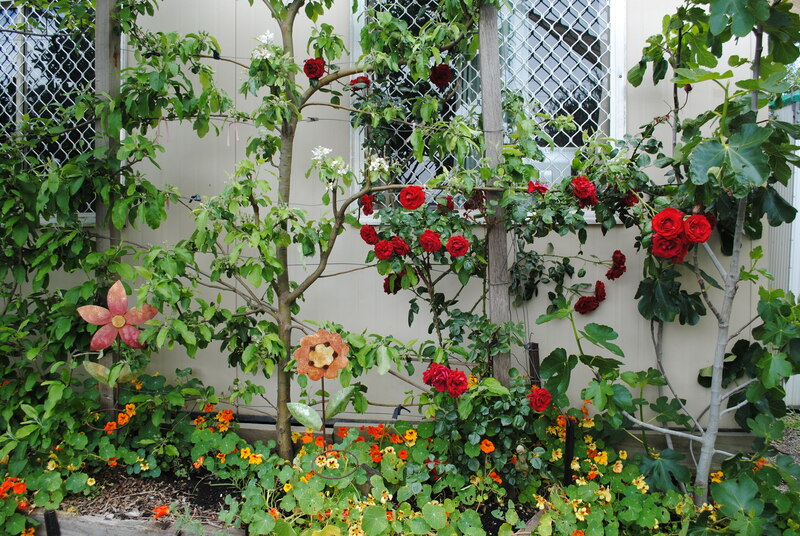 The initiative was the brainchild of John Haig, a Mind employee with a background in horticulture, and a commitment to the therapeutic benefits of gardening for people experiencing mental illness (what is now known variously as ‘ecotherapy‘ or ‘ecopsychology’). Living up to its name, Sprout started out with only one employee and a small group of participants, who began the work of developing the site and carried out some of the external landscaping jobs. After a few years, the project attracted extra funding and the team was expanded to the 4-6 people who have been running Sprout for the past five years. These days, Sprout offers a raft of programs to its participants, most of which are centred around gardening and growing, or cooking and eating homegrown food. Sprout is also all about tapping into the creativity that goes hand-in-hand with gardening, and the garden itself is a testament to this. An enormous amount of artistry is evident around every corner of what is one of my favourite places in all the world. The monthly market and weekly ‘open gate’ are welcome opportunities to take a deep breath and imbibe the smells and sights of this little paradise, with its unlikely backdrop of railway lines and other urban paraphernalia. Mahatma Gandhi famously said, “To forget how to dig the earth and to tend the soil is to forget ourselves”. Sprout gives its participants a way to remember themselves through gardening, and it gives the wider community a unique place to escape to, where the confusion and conflict of the world outside is banished for a while. Sprout Community Market has started up again for 2014, with the first market for the year on Thursday March 6th, followed by April 3rd and May 1st. Then there’s a break over the winter months, with the gates opening again in September. Autumn in Melbourne is a lovely time, and there’s nothing better than spending a Thursday evening in the surrounds of the Sprout Gardens, eating, pottering, checking out the local wares, and catching up with the Sprout community. 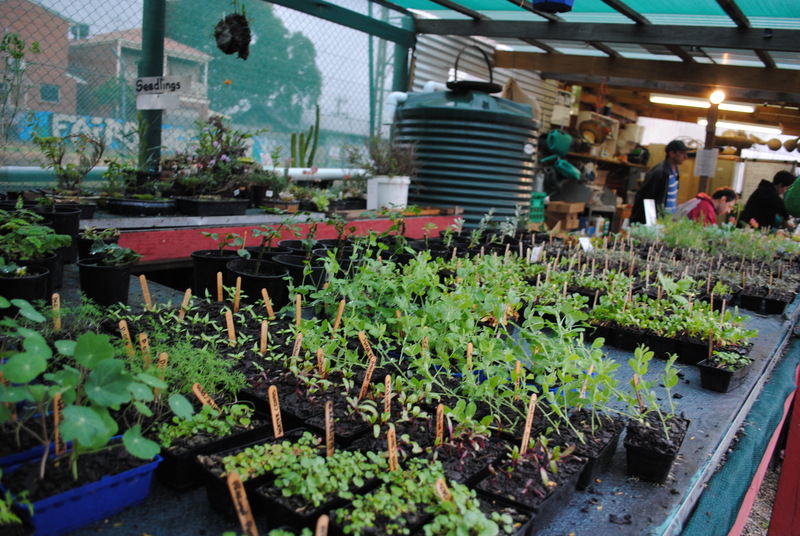 Sprout gardeners propagate and sell a range of seedlings, and I can vouch for their quality. Over the years, I’ve grown lots from Sprout seedlings and plants, and I suspect some of my current vegetable crop are second-generation Sprouts. 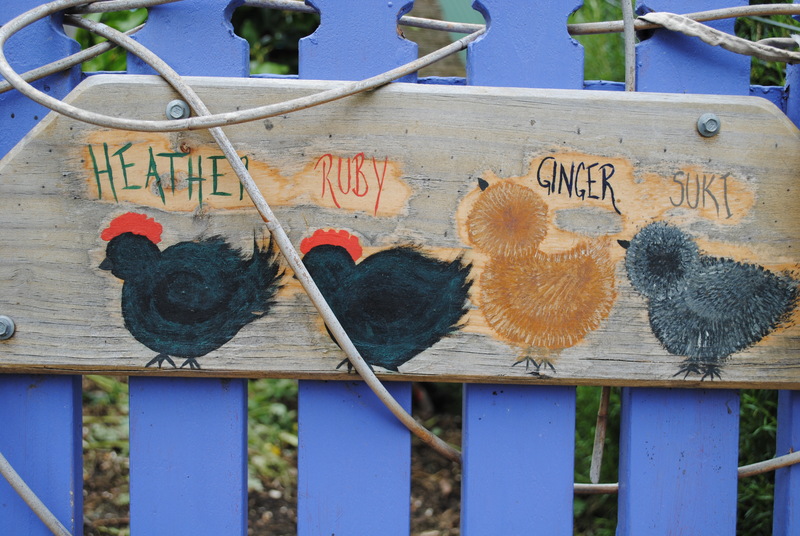 Sprout Market sells the garden’s seasonal produce and eggs from the Sprout chooks, Heather, Ruby, Ginger & Suki. These same eggs feature in the delicious Japanese omelettes (tamagoyaki) that are cooked up by Sprout participants. 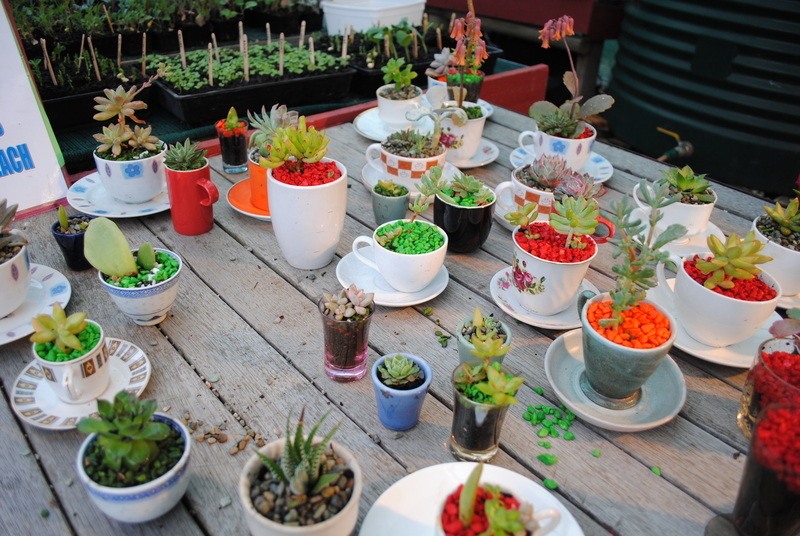 A Sprout participant makes and sells these succulents in op-shop china. Pure genius, I reckon, combining recycling and gardening, and coming up with these little living works of art. I plan to start a collection. 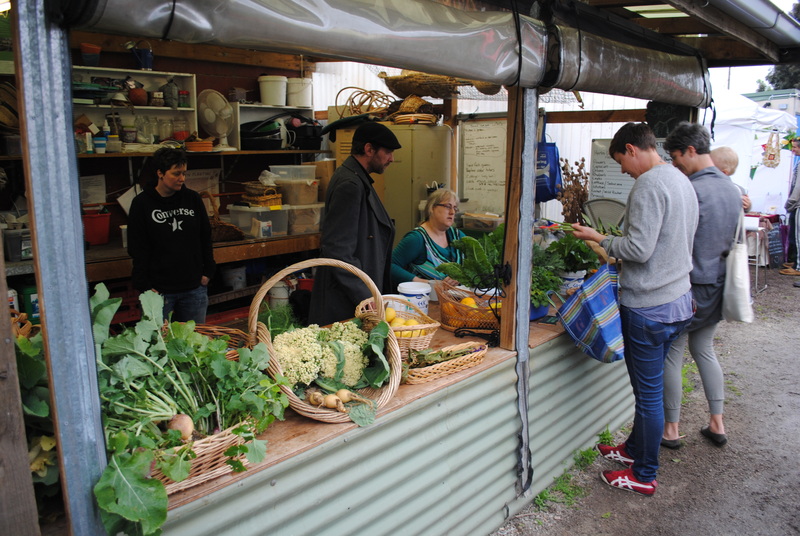 One of the nicest things about Sprout Community Market is the element of surprise each month, as there are always new stallholders alongside the regulars, and it’s always unusual and creative stuff. Sprout welcomes anyone who is interested in having a stall, in volunteering to help out on the day, or in supporting their good work by just coming along to the market. Each non-Market Thursday Sprout holds an ‘open gate’ from 1pm – 4pm, giving you a weekly chance to wander around this amazingly productive and beautiful urban garden and purchase Sprout seedlings, produce and preserves. Sprout Garden is on the corner of Watt & Clapham St in Thornbury, Melbourne. You can contact Sprout via their Facebook page, via email or on (03) 93845565.